Do you want easy steps to install WordPress on your web server? You will get to know how quickly you can install WordPress, all steps with the screenshots; you only need to follow a few easy steps. 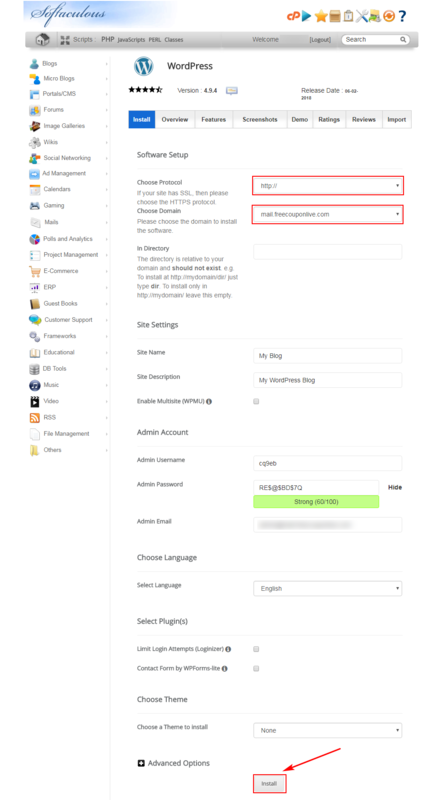 Here I shared a method to Install WordPress using Softaculous script (One of the straightforward ways to install WordPress from cPanel), it is a best scripts installer use by many web hosting providers like SiteGround and inMotion Hosting. Before installing WordPress first, you will need a domain name and a good web hosting with cPanel access. Fortunately, all good WordPress hosting company provide cPanel and FTP access. I highly recommend SiteGround hosting (70% off) for new and growing blogs; they provide in-house technology for WordPress to speed up your website. Otherwise, you can go for Bluehost one of the best web hosting provider, and both companies offer the best performance, uptime, and security. And also both hosting companies recommended by WordPress, itself. Bluehost offers a free domain name and 60% discount on their web hosting. Softaculous is one of the best and famous Applications Installer for WordPress, Joomla, etc. So, you will quickly install WordPress within five mins to using Softaculous. One of the best method Installing from cPanel for beginners. Many hosting companies like SiteGround and InMotion Hosting use the Softaculous script to offer Applications installation from their cPanel. I use SiteGround cPanel in this tutorial. First, you need to Login to your cPanel and click on WordPress Installer icon (Look under WordPress Tools section in Dashboard). 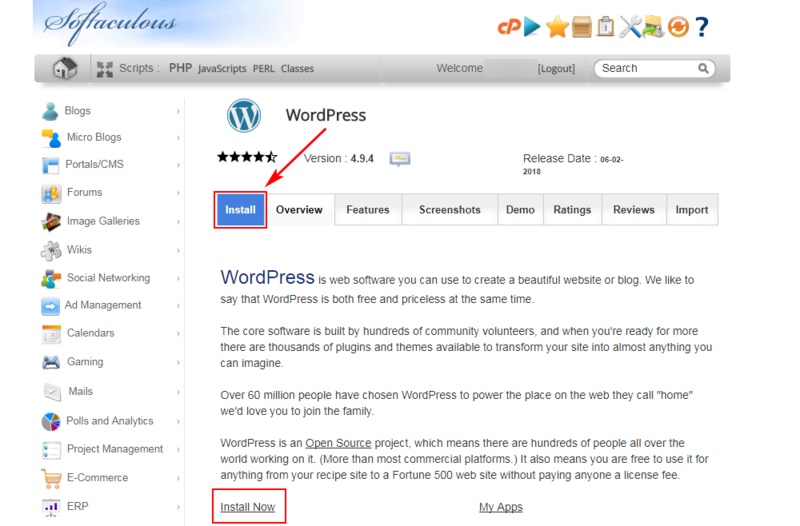 Now, you will see WordPress page in Softaculous Script, just click on first “Install” tab. After clicking on Install button, you will see the WordPress install page, which you need to fill. First, you need to choose a protocol. If you install on the directory of existing website like wpsagar.com/blog, then select same protocol as you already use in your root domain. And for the new site, you should go for https (you can use Lets Encrypt SSL Certificate it is free and easy to use) with www or without it at your own choice. Now, choose domain name by clicking on domain name (If not already selected) where you want to install. Leave directory empty. Otherwise, enter the name of the directory (e.g., blog) for your website. After that, come to the Site Settings (Site Name and Site Description) as you can see already filled. However, you can change that with your Blog Name and Blog Description or move for next (It is easy to change anytime from WordPress Dashboard). Now, come to the Admin Account (Admin Username, Admin Password, and Admin Email) that is too filled. However, make sure email ID is correct because you will get your login details to the same email address. Now time to click on bottom “Install” button, after clicking on that you will see install progress bar for a few seconds and after that, you will see Congratulations message with the software install location and login page. Now, log in your WordPress blog with admin username & password and start publishing blog posts. I remember those days we used to upload the script to server with FTP app. Then cPanel came with easy installation wizard. Now things are quite quick. I know some folks still don’t find it easy. That’s where your guide here becomes very useful. Thanks for providing the info, it will help me a lot while installing wordpress for any website in future. Thanks for liked it. You can bookmark this article for easy access in the future. Also, please add your image on Gravatar.